You know what my layouts are usually like...3 or 4 or 5 patterned papers, lots of embellishments, usually a bit of fussy cutting to make it all look nice and lumpy bumpy and layered. Well, you can probably imagine what I thought when I got a challenge to do a layout using ONLY these things - 1 sheet of shaped paper (and that was the ONLY bit of paper I could use for the whole thing!!! ),2 ribbons, 3 alphabets, 2 chipboard pieces, staples, masking tape and string . 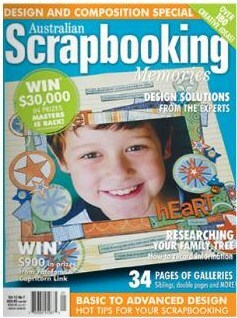 This was the recipe challenge that I took part in for the latest issue of Scrapbooking Memories Magazine. When I read what I had to do, I was like - What The? Only 1 sheet of paper??? Masking tape???? I couldn't seem to get a good pic of this one, my white background kept coming up bluish, but you get the idea. See the flower I made out of the masking tape? Thought I was pretty clever doing that, lol. You can see what the other 3 scrappers did with this challenge on pg92 of this months SBM (vol 12 no 10). Well, I think that's about all the computer time I can sneak in at the moment. I've promised to read the kids 2 chapters of their book tonight, instead of 1, so I'd better go and have a cup of tea and prepare myself. Lol, I miss those days when I could skip whole paragraphs and they were none the wiser. These days, they follow the words as I'm reading, and always pick me up on it if I skip bits!!! Good job! What a great layout considering the challenge they gave you! You rocked this challenge. If you hadn't posted you used masking tape, I never would have known! Sweet picture and great flower! Sam, this layout is absolutely fantastic. I love the masking tape flower. You are a genius!!! You pulled it off beautifully!!! It is stunning and jumped right out at me when Mum handed over her copy last week. Hope holidays are going well...hugs. Wow what an incredible use of masking tape, you really rocked this challenge!! WTG! OMG! Only 1 piece of paper - you were very brave Sam but very creative this turned out beautifully and who would have thought to make a flower with the masking tape - very creative Sam! I loved that flower when I saw it in the mag. You certainly nailed this challenge and I agree, it would have been very hard. hee hee! That would have been a tough challenge, but you pulled it off beautifully! !